* Transform your brooches to fabulous hair combs with Mariell's unique comb converter. * Slide the pin through the comb's loops to create a great hair ornament. * Most of Mariell brooches can be converted to fabulous hair accessories with our Comb Adapter style MRL-3253H. 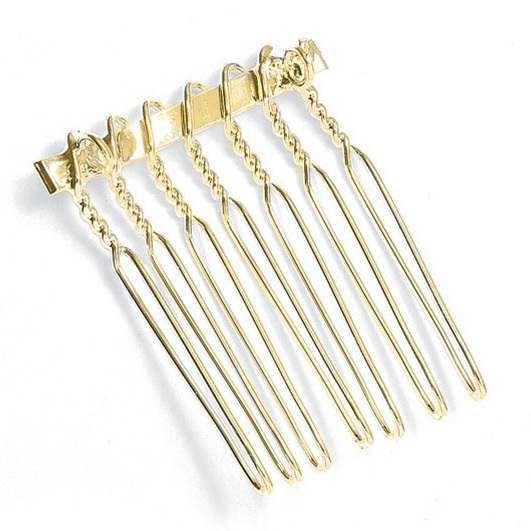 * Just slide the pin through the comb's special loops to create your hair accessory. * The adapter is not permanently affixed so it can removed as desired and the pin can still be worn as a brooch. * The comb measures 1 1/8" w x 1 1/2" h and is available in Gold (shown) or Silver as style 3253HP-S.